In 1976, Ms. Ross had just had hit #1 for the third time with “Theme From Mahogany (Do You Know Where You’re Going To)”. While not everything was going well (she had actually left the production of the film Mahogany before its completion), her recording career was in a very good place. The 5th Dimension, on the other hand, had not had a top 40 hit of any kind since 1973. Two of the original quintet, Marilyn McCoo and Billy Davis, had just left the group. This was a group in need of a hit. Enter Pam Sawyer and Marilyn McLeod, songwriters for Motown. Working together, the two of them wrote “Love Hangover”, a song about the feeling one gets after, well, love. “Love Hangover” was intended as a disco song, but apparently Motown had not yet warmed to the idea of releasing anything disco. That reticence was not shared by Motown producer Hal Davis, so he got some session musicians together and laid down the instrumental track, which starts off sounding like a mid-tempo ballad before launching into a thumping disco beat. Diana Ross was not keen on recording a disco song, so producer Hal Davis went out of his way to set the right tone when she recorded her vocals. He scheduled the session at night, when Ross was most agreeable, and had engineer Russ Terrana set up flashing lights in the studio. Before sending her in, Davis had Ross relax with a drink of vodka (her libation of choice). When it came time to record, she kicked off her shoes and got into it, improvising and having a good time. At one point, Ross let out a laugh that made its way onto the record. The vocal was exactly what they were looking for. And so it was that an almost eight-minute version of “Love Hangover” made its way onto Ms. Ross’s second self-titled album. 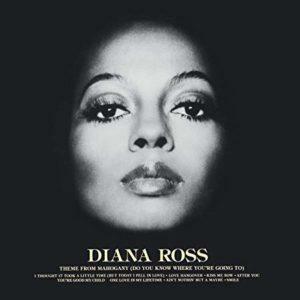 Diana Ross also featured “Theme From Mahogany”, which is considered the first single from the album despite having already appeared on the soundtrack to the film. Everyone must have thought this was a sure thing, as the single was quickly produced without a supporting album. This version sounds fairly similar to Diana’s version, though the 5th Dimension version is a bit more synth-heavy. Florence LaRue does a passable vocal, though one gets the feeling that she was trying to sound like Diana without actively copying her style. Depending on who you ask, either Berry Gordy or Diana Ross was responsible for Ms. Ross’s version of “Love Hangover” being rushed out to compete with the 5th Dimension’s version. * Regardless of who made the call (this page will assume it was Mr. Gordy), Motown pulled its promotion of “I Thought It Took A Little Time” and released “Love Hangover”. 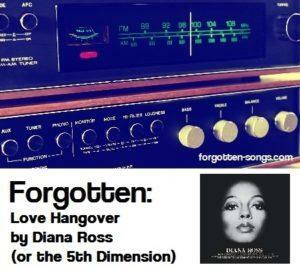 That portion of the online world that remembers this particular period of top 40 radio history seems to be in agreement that radio stations were playing the 5th Dimension cover version of “Love Hangover” at first, but that they switched to Diana’s version once it was released. That appears to have played out in both versions’ chart performances. Interestingly enough, both competing versions of “Love Hangover” managed to debut on Billboard’s Hot 100 the same week, that being the week ending April 3, 1976 (chart). Ms. Ross’s version had the higher debut position, coming in at #78, while the 5th Dimension charted at #95. From there, it became evident that Motown’s strategy had paid off in that the 5th Dimension’s cover of the song was not destined to fare as well as the original. The 5th Dimension version of “Love Hangover” peaked just three weeks later (chart) at #80. (You’ll notice that its peak was lower than Diana’s version’s debut position.) Amazingly enough, the week it peaked would also be its final week on the chart. The Diana Ross version, on the other hand, was a smash hit. It was still climbing the charts when the 5th Dimension version fell out, making a 19-position leap into the top ten in the chart’s first week without its competitor. On May 29 (chart), Diana Ross’s version of “Love Hangover” became her fourth solo #1. It remained at #1 for two weeks before being replaced by the same song it had knocked out two weeks prior, Wings’ “Silly Love Songs”. “Love Hangover” remained on the Hot 100 for 18 weeks and ended 1976 as that year’s #15 song (magazine). If the 5th Dimension and Diana Ross were starting to appear to be going in different directions before “Love Hangover”, they really did so following its release. The 5th Dimension switched labels, moving, interestingly enough, to Motown to record two more albums which promptly went nowhere. After that, as Steve Huey at Allmusic puts it, “the group resigned itself to the nostalgia circuit”. The group is still performing today (see their website), with a rather different lineup but with Florence LaRue still leading. As for Diana Ross, she obviously continued to have much chart success well into the 1980s. She, too, is still performing, including a recent appearance at the Grammy Awards on her 75th birthday. She doesn’t have an official website; however, this site has all the latest touring and ticket information. As one might expect, the 5th Dimension’s version of “Love Hangover” vanished without a trace from American radio right around the time it fell out of the Hot 100. Diana Ross’s version, however, is also not that easy to find on terrestrial radio these days. In the past, one could find it on some sort of 1970s show that would pop up on Saturday nights, but those types of shows have seemingly been replaced by satellite radio’s “70s on 7”. So which one do you prefer? It’s certainly easier to find the original version of the Diana Ross rendition; most of what I have found of the 5th Dimension’s cover consists of re-recordings, which are almost never as good as the original. But you can get the original versions right here and decide for yourself which is better. * Most people appear to think Mr. Gordy is responsible, but LaMonte McLemore states rather emphatically that it was Diana. However, there are also others who dispute his account of things rather strongly.